Brand Identity, Tone of Voice, Signage & Way-finding. Bondi Road is known for its great food, and the latest addition is no exception. 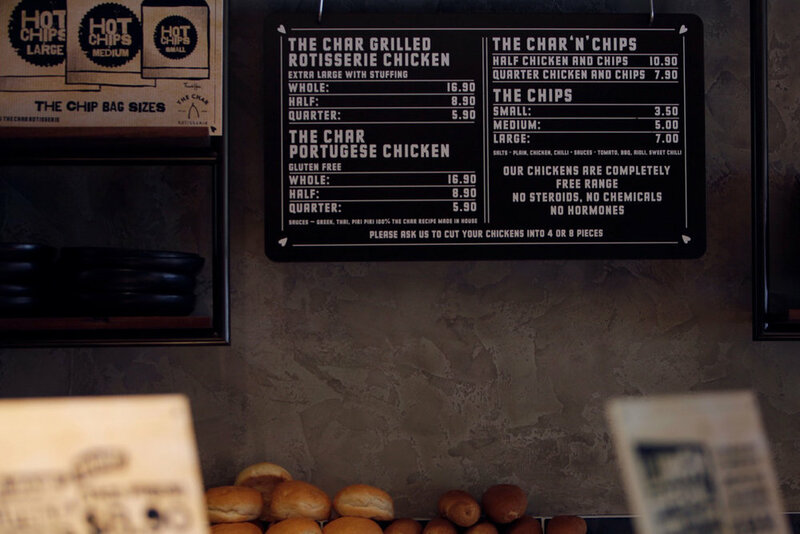 The Char Rotisserie opened in early 2013, and has been serving up fantastic food with a smile to locals and travellers alike. TNG joined forces with Morris & Co, Unita and Aisle6ix on the internal and external graphic design. The Char brand and offering has seen huge success and is now branching out across the Eastern Suburbs. The strength of this brand mark saw TNG featured in Gestalten's 2015 'Los Logos' book (Los Logos 7 is the authoritative reference on contemporary logo design worldwide). As well as being featured on Grits&Grids and The Art of the Menu. A collaboration of excellence — Charlie Parker. Financial planning software — ai.